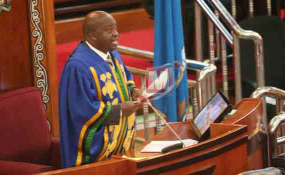 Dodoma — Speaker of Parliament Job Ndugai said on Monday, September 10, 2018 that women Members of Parliament (MPs) with false eyelashes and false finger nails will not be allowed to enter the legislative house. "With the powers vested in me by the Constitution of the United Republic of Tanzania, I now ban all MPs with false eyelashes and false finger nails from stepping into Parliament," he said. Mr Ndugai announced the ban shortly after the Deputy Minister for Health, Community Development, Gender, Elderly and Children, Dr Faustine Ndugulile, told the House that women with false eyelashes and false finger nails face several health complications that cost the country dearly. He said every year, the Muhimbili National Hospital (MNH) receive at least 700 women with health complications that are directly linked to the use of false eyelashes, false finger nails and skin bleaching. Dr Ndugulile was responding to a question from Ms Fatuma Toufiq (Special Seats - CCM) who wanted to know the number of women who have been adversely affected by the use of false eyelashes. According to Dr Ndugulile, false eyelashes and false finger nails do not fall on the list of cosmetics as outlined in the Tanzania Food, Drugs and Cosmetics act (TFDCA) Cap. 219.